Work your way up to Division 1 in Jam. The first time you ever race in Jam, you start in Division 11, which is a qualifying division. 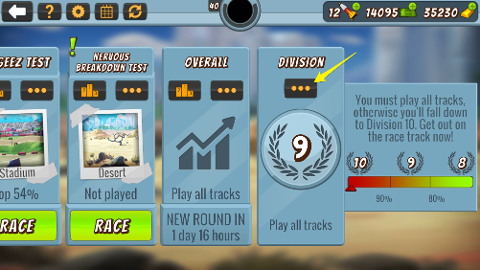 At the end of your first round, you’re placed into your starting division based on your overall results. 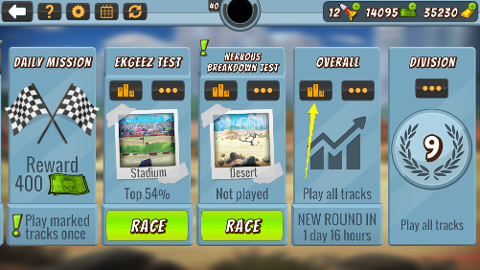 You can find your overall results at any time on the Jam main menu, by tapping the Leaderboard icon on the Overall card. If you’re in the top 10 percent in overall time, you’ll be placed into Division 1. If you are currently in Division 3 you will need to finish in the top 20% of players to move up to Division 2. Then the next week you will need to finish in the top 10% of players to move up to Division 1. Confused? The easiest way to tell how you stand in a given round, and if you're poised to move up, down, or stay the same, is to tap the Settings icon on the Division card. This opens a simple slider that lets you know what division you would be in if the current round ended immediately.